All PostsHealth & FitnessHome / All Posts / Importance of a Protein Packed Breakfast! Starting the day off with high protein packed breakfast can and will make you feel fuller longer! 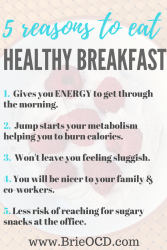 I know many people skip breakfast and that is a big NO NO!! You need breakfast to jump start your engines people! It gets your metabolism moving and grooving. To expend energy, your body needs energy! Would you drive your car to work with no gas? No! Why? Because it needs gas to function properly. Now I am not a doctor nor an expert. I am just telling you what I have learned and personally experienced throughout the years of my fitness and health journey. There is no real science behind this post, just trying to help you, by letting you know what has worked for me. Here is the thing… you DO have the time, if you make the time. You need to make your health a priority and a habit. Try waking up 10 minutes earlier. Or make Egg Muffins (click here for recipe) in advance so you can grab and go! When I am in a time crunch or on the road I also supplement with bars and shakes. (Click Here to watch my YouTube video on what brands of protein I buy and when I use them.) Supplement is the key word here. Shakes and bars are a great source of protein however, you do not want them to be your main source of protein, all day, everyday. Having a shake for one meal is fine, however do not use shakes as a substitute for multiple meals. BUY WHY?? You should try to get the majority of your protein from whole foods such as eggs, greek yogurt, seafood, chicken and other lean meats. These whole foods have many other nutrients that your body needs to function. You just can’t get everything you need for a healthy body from shakes and bars alone. Plus, I tend to feel hungry shortly after a shake alone. I need that dose of protein to be accompanied with veggies and simple carbs to really hold me over until the next meal! There are many benefits to eating breakfast and consuming a diet high in protein. You can get all scientific BUT at the end of the day, the whole point is to have a happy, healthy and strong body. You only get one vessel in this life, so you better take care of it!